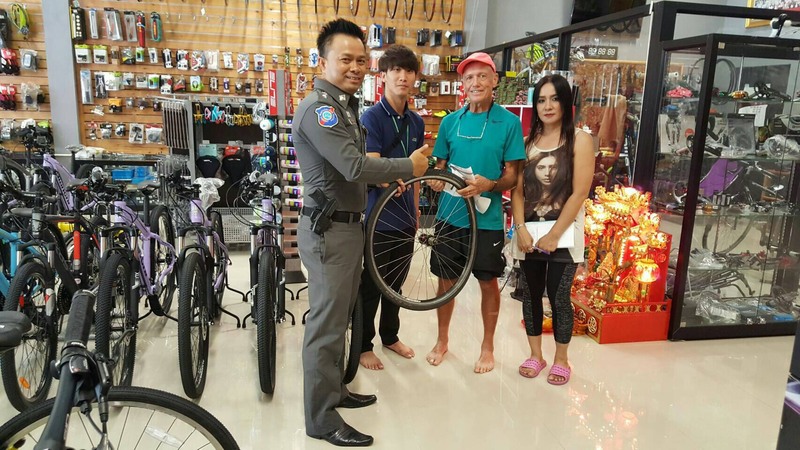 An elderly Australian stuck by a pickup truck in Pong while bicycling on Santhikarn Road, a connecting road to Highway 7, ended up getting a new bike thanks to the Tourist Police. Rodney Arthur Ellis, 69, was hit while riding his import bike. Police eventually tracked down the driver of the pickup, Poripat Jarastipmanee, 25, who admitted to driving carelessly. He was arrested and charged with reckless driving. Australian Rodney Arthur Ellis was happy to get his bike repaired thanks to Pattaya’s Tourist Police. The Thai man also was forced to compensate the Aussie for both damage to the wrecked bike and medical bills. Pattaya Tourist Police commander Pol. Maj. Piyapong Ensarn oversaw the repair at a local shop were tires and some parts were replaced. But some were not available locally and had to be ordered, with delivery expected within a week. In the end, the Aussie biker was happy to get new wheels and his doctor bills covered and thanked the Tourist Police for its help.